I often get inspiration for my DIY’s while on-line shopping. 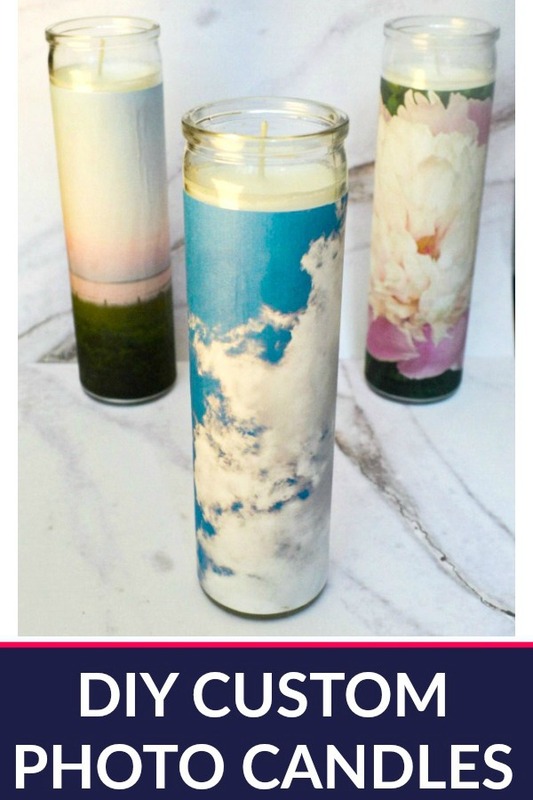 For this project, I was looking through Urban Outfitters home decor and I came across these cool jar candles with funky photographs and I said, “Eureka! I can make that!” They were super simple and so cheap to duplicate. 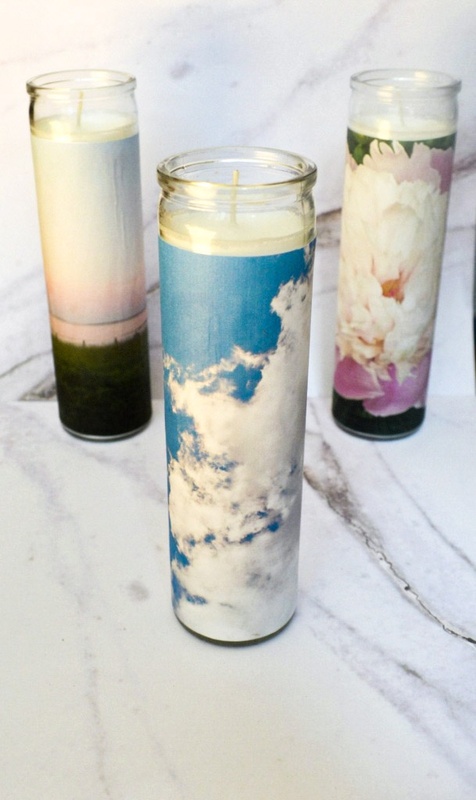 You have to give these DIY Custom Photo Candles a try! I chose to use photographs that I took and you can totally do that OR you can go to a stock photo site and find something you love. I can totally see myself making a set of these seasonally. Can you picture this with gorgeous fall leaves? What I love about this project is that it really is super inexpensive, it is quick and easy and it’s completely custom. You don’t need much in the way of materials, either. 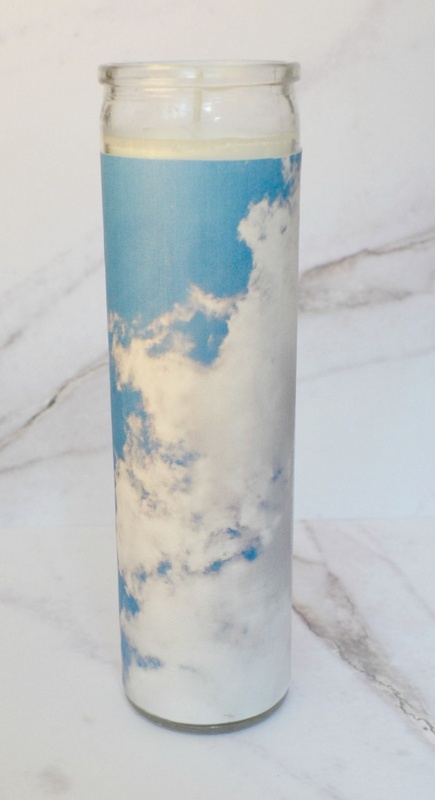 This is one of those crafts that is perfect for the person who says they aren’t crafty! 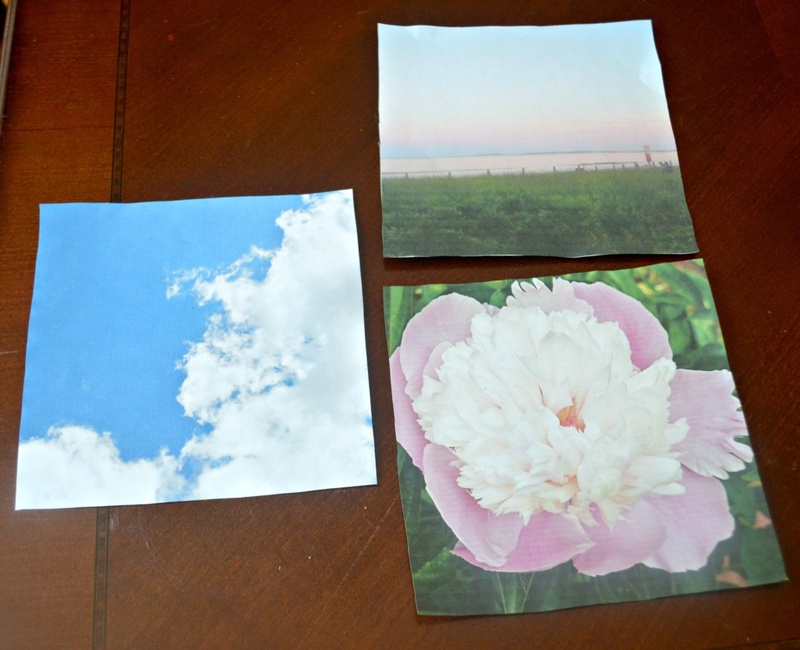 Step 1: Print and cut your photos to size. I printed my photo to 8×10 and then wrapped it around the candle to figure out how much needed to come off the length and width. My picture ended up somewhere around 7×6, but that will vary if your candle is a different size than mine. To be honest, this was kind of an eyeball situation. Just cut straight and make sure you’re getting the best part of your photo! And guess what? If you mess up, just print another photo. I printed mine on cheap copier paper, but a slightly thicker stock would probably be nice, too. 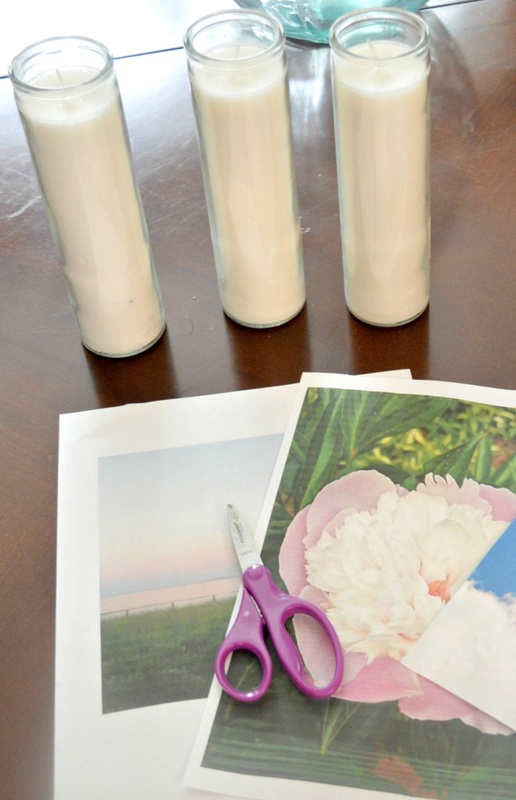 Step 2: Apply mod podge to the candle and carefully affix your photo to the mod podged candle. This part took a little bit of patience, but just go slow and try to squeeze out any bubbles or wrinkles as you go. I may have left a few wrinkles behind and I’m fine with that. If you are a perfectionist and can’t deal with the bubbles, take it really slow and maybe use a credit card to smooth things out. Step 3: Allow to dry. Yes, that it’s. The end. Project done. The Urban Outfitters candles are on sale for $14 each. These candles were basically $1.50 each if you include the amount of mod podge and ink and paper used. Plus, these are unique! They are totally you! Your picture, your blood, sweat and tears… Okay, really no blood, sweat or tears involved. Unless you get a paper cut. But this is your vision. When someone says, “Ooh, I love those candles!”, you get to say “Thanks, I made them!”. And don’t forget, if you mess up with the mod podge, I have a super handy post about how to remove mod podge! You’ll have to print your pictures again, but the candles will be salvaged! Ok, so now I need to know, where do you get your crafting inspiration from? Pinterest, obviously, but what else? I’m on the hunt for my next project! 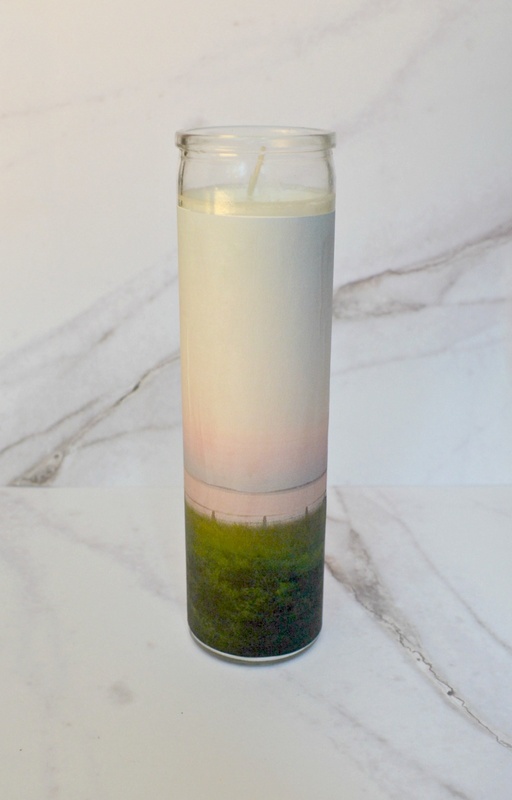 Hi Marybeth, I love quick and easy and your candles can be something I’ll be making next! You’ve got my creative juices flowing here….